What is the first thing that springs to mind for you from the year 1983? For instance which films, books, music, or fashion do you remember or stands out for you? For me it was living in West Berlin, and Nena’s hit 99 red balloons which was hardly a classic but that’s what seems to stick. Anyway it goes without saying that much has changed in the intervening 30 years, and the pace of that change is accelerating. Can we really comprehend what change we will live through in the next 30 years? The history of futurology is littered with many fascinating mis-predictions which systematically fail to factor in the new and unexpected innovations of tomorrow. 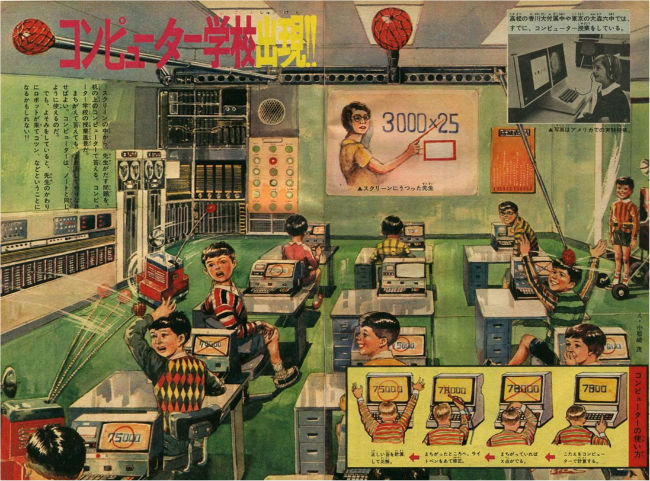 Take for example the fascinating image below which shows a Japanese prediction from the 1960’s of what a classroom would look like in the future. As with almost all predictions they got many things right, such as the focus on computer-based learning, but also many things (somewhat disturbingly) wrong such as the robot ‘whacker’ which punishes poor behaviour or performance. At 100%Open, most of our work has traditionally been focused on delivering new value within a few weeks, months or a few years at best. However more recently we’ve been doing a lot of much longer term work in the transport and defence industries, working closely with Tamar Kasriel from Futureal. We have been learning a lot about how best to adapt to an uncertain future. There is a huge and often overlooked difference between what can happen, versus what will happen, versus what should happen. Step 1: Surface assumptions – We’ve learned that people don’t share the same assumptions about the present let alone the future, so inviting people to independently capture, share and discuss their current assumptions about the future is critical first step. Step 2: Cluster and quantify trends – Once these assumptions have been surfaced there will no doubt be connections and even overlaps that can create a manageable shortlist of say 20 clustered assumptions. For instance ‘The rise of China…’ might be part of a wider assumption of a “Shift in economic power from West to East’. Wherever possible we’ve found it’s helpful to reframe these assumptions as quantifiable (if possible) e.g. passenger capacity on the UK rail network is to double within two decades (or similar). 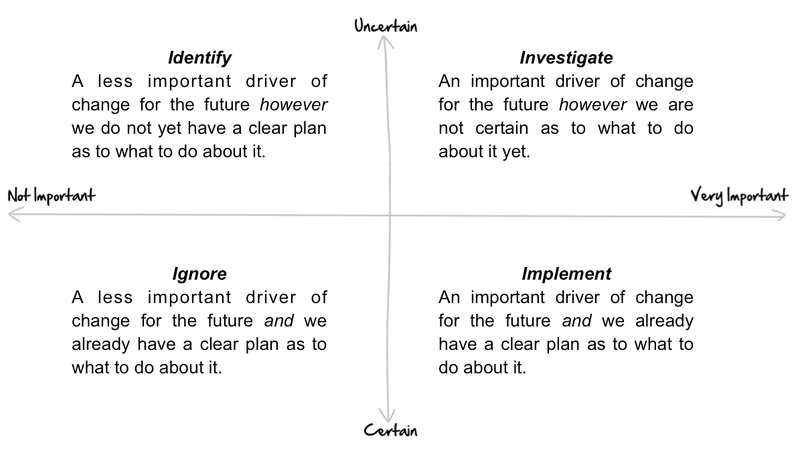 Step 3: Map importance vs certainty – Once we have a shortlist of trends, it’s helpful to identify their importance on us or our organisation, and also our certainty as to what we do about it. For instance ‘increasing regulation’ may be identified as very important but we are also certain as to what to do about it i.e. comply with it and seek to influence it. However, increasing ‘urbanisation’ may be also identified as very important but we are less certain about what we do about it. Step 4: Ignore, identify, implement, or investigate? – Once the trends have been prioritised by importance and certainty we can decide what we do about them. Do we ignore as irrelevant (unimportant, certain), identify an off the shelf solution (unimportant, uncertain), implement a plan of action (important, certain) or investigate further what capabilities and knowledge we need (important, uncertain). Step 5: Prototype! (iterate, listen & learn) – Lastly and most importantly, although steps 1-4 are bound to spark debate and disagreement, it’s vital to place some bets and do something about them, especially those in the ‘investigate’ box. And it’s even more important to measure, edit and amend these plans and projects regularly. Revisit steps 1 to 4 regularly which fresh eyes and new data, and don’t be afraid to change course. After all that’s not only how we learn, but also how we start to create the future we want and need. The above process is still a work in process for us, however, we share it here as ever to spark discussion and invite feedback. We look forward to your comments and builds.